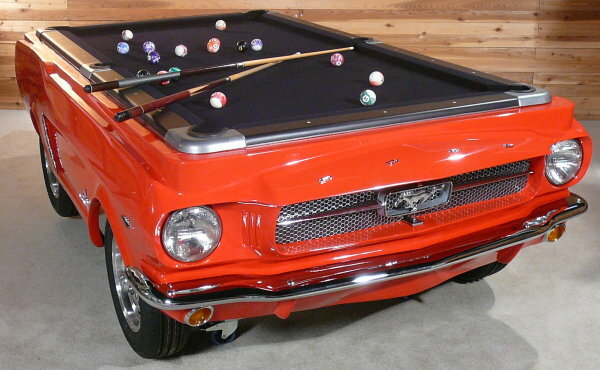 In my travels to automotive events and venues around the country, I have seen plenty of car-themed pool tables but the new 1965 Ford Mustang pool table licensed by Ford Motor Company and offered by the folks at CarPoolTables.com appears to be the first factory-backed example of these game room centerpieces. CarPoolTables designed this ’65 Mustang pool table to be as close to the original as possible and in forming the fiberglass exterior body of this table – the company used actual body panels from an original 1965 Mustang. While this 4x8 1965 Mustang pool table is obviously smaller than the real thing with a total length of 119 inches (the actual 65 Mustang is 181.6 inches long). The front and rear portions of the vintage Mustang pool table look remarkably similar to the road going pony car but along the sides, the difference is clear as the majority of the doors have been removed to make this piece of automotive artwork small enough to comfortably fit in a game room. Plus, if it was the actual length of the ’65 Mustang – it would be nearly impossible to shoot from the ends of the table with the surfaced centered front to rear. Once the body of the 1965 Mustang has been shortened to proper pool table length, the company adds genuine badges, chrome trim, chrome badges and working lights in the front and rear. The 1965 Mustang pool table is available in any color offer from the 1965 model year including Caspian Blue, Champagne Beige, Dynasty Green, Honey Gold, Ivy Green, Midnight Turquoise, Poppy Red, Prairie Bronze, Raven Black, Silver Blue, Silversmoke Gray, Springtime Yellow, Sunlight Yellow, Tropical Turquoise, Vintage Burgundy and Wimbledon White but Rangoon Red (shown above) is the most popular choice. The 1965 Ford Mustang pool table sits on real aluminum wheels wrapped in actual tires but it’s unclear whether you have to check the air or if the tires are filled solid so that maintenance isnt a concern. This new 1965 Ford Mustang pool table is a gorgeous collectable but it is also a high end pool table with three-piece Brazilian slate and championship quality felt sitting in a hardwood frame. This is the ideal centerpiece for any Mustang collector but it is not for those with small bank accounts – as buying a vintage Mustang in need of some work might cost you less than buying one of these pool tables. The MSRP on CarPoolTables.com is $9,995 so it is substantially pricier than your average championship pool table but if you love the Ford Mustang and you are looking for the pièce de résistance for your collection …it doesn’t get any better than this pool table.